Amazing image sharpening Photoshop-compatible plug-in for Windows that can work as with commercial software like Adobe Photoshop, Adobe Photoshop Elements, Microsoft Digital Image Suite as free like software IrfanView, XnView. Magic Sharpener is amazing image sharpening Photoshop-compatible plug-in for Windows designed by ImageSkill Software that can work as with commercial software like Adobe Photoshop, Adobe Photoshop Elements, Corel (Jasc) Paint Shop Pro, Microsoft Digital Image Suite as free like software IrfanView, XnView. 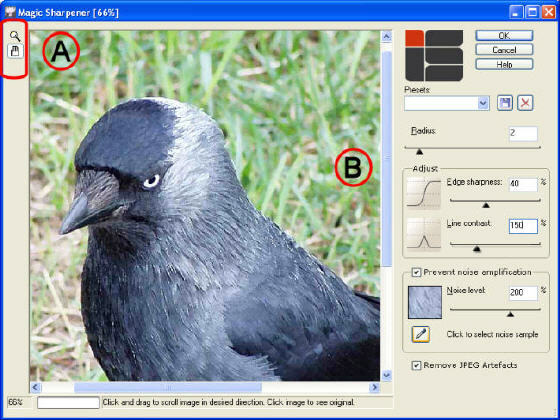 Magic Sharpener allows a user to get dramatically improved the look of images by perceived sharpness increasing without color halos and increased color noise. This plug-in increases the contrast along edges and gets more sharpness and contrast to fine details making them more visible. The latter features can be managed independently doing sharpness enhancement to be content-sensitive in some sense. Since sharpness increasing is very creative process when one is trying to satisfy its own demands that in general contradict each other the separate processing of edges and fine details give everyone unbelievably easy way to realize his own flight of fancy. It is the main feature that differs this plug-in from other. Plug-in’s installer automatically detects the following graphic host applications: Adobe Photoshop 7, CS, CS2; Adobe Photoshop Elements 2, 3, 4, 5; Jasc Paint Shop Pro 7, 8, 9; Corel Paint Shop Pro (Photo) X, X1; Corel Photo Paint 11,12; Xara Xtreme; Microsoft Digital Image Suite 2006; Macromedia Fireworks 2004, 8; Ulead PhotoImpact 8,9,10,11,12. Plug-in can work under the following graphics host properly: XnView, IrfanView, Corel Painter. Magic Sharpener is mazing image sharpening Photoshop-compatible plug-in for Windows which allows a user to get dramatically improved the look of images by perceived sharpness increasing without color halos and increased color noise. Tile Builder - a Photoshop-compatible plug-in. Tile Builder creates seamless patterns. You can save generated rectangular seamless pattern as BMP, JPEG or PNG graphic file. Translucator - a Photoshop-compatible plug-in that can work with Adobe Photoshop, Adobe Photoshop Elements, Corel Paint Shop Pro, Microsoft Digital Image Suite etc. Translucator extracts translucent objects from photo with a perfect result. Image Repainter - Express pleasing colors from desirable prototype image to images to be corrected. It is useful for recoloring of a series of image shots. Outliner - A free Photoshop-compatible plug-in for Windows which can be very useful plug-in for web designers creating graphic icons and for artists dealing with engraving. Magic Enhancer Pro - Essentially improve your photos adjusting its lightness, contrast and color balance.